One of the more unusual productions staged by The Young Theatre (Harrow). 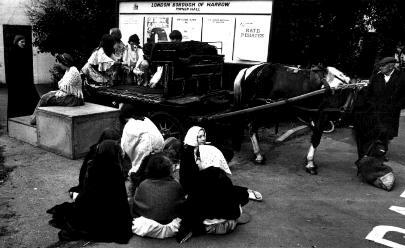 This miracle play was performed at several venues as part of the Harrow Arts Festival, from a horse-drawn cart. 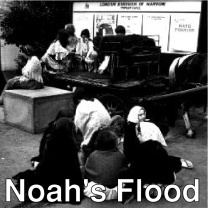 The horse, with cart in tow, was hired from Portobello Road (no local horse and carts being available for hire!) and the horse not only had to contend with the long haul from London, but then had to wander around Pinner and Harrow before doing the return journey… on two consecutive Saturdays! However the horse was well used to this sort of mileage, and was treated with much affection by all members of the group and their audiences.